Wader Quest: It's November!! Happy Birthday Wader Quest. It's November!! Happy Birthday Wader Quest. Three years ago today Wader Quest took it's first tentative steps. During that time we have adopted and adapted, like changing our logo for example, to try and head in the right direction and today we announce another change to celebrate our 3rd anniversary. We felt that this change of name better reflects the relationship we want to have with our supporters emphasising the community of like minded people aspect and not the financial transaction aspect that being a sponsor can imply. The different categories within the Friends will still apply as Individual, Family and Life, the fees remaining unchanged. We feel that the categories of Club and Corporate Sponsor are still appropriate, as they are of a less personal nature, and that they should remain the same. In the three years since we started we have raised £8,866.37 and used it to benefit Spoon-billed Sandpipers, Hooded Plovers and Magellanic Plovers, our three main projects so far; we have also helped projects with donations in various amounts in South Africa, Peru, Indonesia, St. Helena, and the USA. We are proud of our achievements and know that with a little help from our Friends we will be able to do much more. So please help us to celebrate our anniversary and the beginning of Wader Conservation November by sharing our love for waders/shorebirds and preparing to get involved with the events we are doing to celebrate wader conservation around the world, starting next weekend with our second World Watch. Wader Conservation World Watch is your chance to manifest your concerns for the appalling declines in wader populations worldwide simply by going out and looking at these wonderful birds. Stand up and be counted make your concerns known. 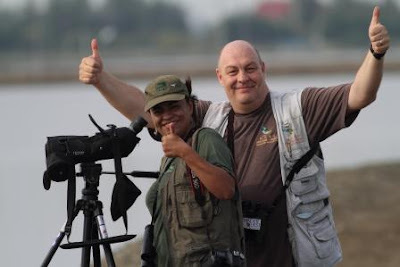 Pak Thale, Thailand... guess what they just saw!